Remove tea bags and add sugar to hot water, stir until dissolved. Add baking soda and peach nectar and stir. 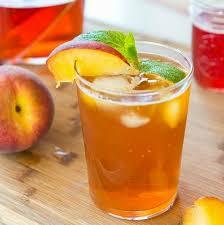 Pour tea mixture into large pitcher and stir in 10 cups of ice water. Stir in 1-2 tablespoon of freshly squeezed lemon juice. Add sliced, fresh peaches and serve over ice. Makes one gallon of peach iced tea.